With that ordeal out of the way I set my mind on Christmas again. Once the Christmas meal was out off the way the panic attacks went away with it. I still couldn’t sleep at night, but I was learning to deal with that, each night I felt like I could sleep a little longer. The Doctor had said it would take until around Christmas before I was back to normal sleeping patterns and he was spot on. One thing that I really find disappointing during this period was that I stopped journaling, through all the struggles I found I gave up on that time I would find each night to record my most internal feelings, I regret that now, it would take a good few months before I got back into that habit, but I regret letting it go. I kept my blog up to date and posted about where I was with things. I am always honest on my blog, but there are also things I chose not to disclose. Some of my deepest struggles I have kept to myself, I didn’t share them on my blog, with anyone at Church or with my Connect Group. I prayed over them, I never kept anything from God, at the end of the day I figured He knows my heart anyway, He knows the pain I have inside and He wants me to come to Him with it. I did that daily, as I said before at times I prayed not wake, as I didn’t want to live the way I was. There were times I prayed for strength, I prayed for peace, I prayed for me, I prayed for the kids, I prayed for Victoria, I prayed for us, I never stopped praying, I may not have been able to share it all with anyone else, but I certainly shared it all with God. I also kept putting things into poem form, I guess in a way this became my most honest way of posting, things I couldn’t outright say to someone’s face or even write about in a post, I could certainly put into a poem, where I could disguise the content to a certain extent, I could let off steam without being direct about the problem that I didn’t want to disclose, that’s the beauty of poetry, you can be direct and ambiguous at the same time. I wrote a number of poems during this period, but many didn’t actually get finished a posted until some months later. For a while as Christmas approached and the tablets were doing what they were supposed to do, I left behind those feelings about wanting cut the words “I Will Never Be Enough” into my forearms, they were consigned to the desperate times when I felt so alone and out of touch with every one, when I couldn’t explain to anyone where my mind was or how I was thinking. I couldn’t think how I was going to explain these feelings to anyone, they weren’t rational and I chose to just bury them, until they rose again, I would fight them, pray for peace and sleep it off. But with Christmas days away they came back. The previous year I was invited for Christmas Dinner at Victoria’s Mum’s and afterwards I spent the rest of the day alone, this year there was no invite. Victoria asked if I wanted the kids with me, but as I didn’t really have any plans, I would see them in the morning and evening anyway, I thought that they would enjoy being around their cousins at Victoria’s Mum’s and Gran’s again. So I chose to be with them whilst they opened their presents, I would then go to Church, when I return they would be gone, so I would make myself some dinner and watch TV until they came back. But as this day approached I began to imagine myself coming home from Church, going upstairs into the bathroom and carving “I Am Not Enough” into my arms again. I would do that and then just wait there until someone would find me, passed out from the loss of blood. Even though my mindset was so much stronger than it was the previous month when I had these thoughts, I still couldn’t shake them and they got stronger and stronger. Then came Christmas day, I spent the first few hours with the Kids as planned, at one point I left the room to cry, I didn’t want them to see, then later I set off for Church as planned. The Christmas Day service was good as usual, I felt a little odd, everyone else had their families around them, but I enjoyed it anyway. Then I left to walk home, that was when the imagine of cutting into my arms came on the strongest, because now I was entering the actual point where all this could happen. I cried as I walked home, because this year I knew the house would be empty, there would be no life when I got home, just emptiness. When I got in, it felt so bleak, so empty, I felt so lost, so alone. I didn’t feel like eating, I didn’t feel like cooking either. I made myself something to eat anyway, nothing like a Christmas dinner, it was the first Christmas Day ever that I hadn’t had a traditional Christmas dinner, but it was okay, I wasn’t that hungry anyway. I had prayed on the way home, between all the tears, all I wanted was peace, I didn’t want to do what I imagined myself doing, I didn’t want them to find me like that on this day of all days, I had cried out in tears. So now I was home, I had eaten, yet the house was still empty, there was no one here, I had felt so alone, I had felt so empty, but suddenly all of that had vanished, I just settled down, watched a bit of TV and fell asleep for a while. Later when the kids and Victoria came home, I felt okay, all that despair and loneliness was gone, there was no blood, there were no tears, just a happier me. I spent some of Boxing Day alone too, but that was fine. I actually did get to have a Christmas dinner, albeit a day late, Victoria’s Mum had made a plate up for me and sent it home with Victoria, I warmed it up for Boxing Day dinner. Between Christmas and New Year our merchant’s is open, usually just until lunchtime. I actually don’t mind this, it’s not busy and it was good to get out the house and still actually be in a routine. I prefer routine, I’m a much more together person when I have a routine, without that daily routine I can slip back into the lazy waste that eventually became an alcoholic, as I don’t want to go down that road again, I prefer to stay in a routine, I don’t mind the odd lazy day, but generally I thrive on routine. For some reason over Christmas I had to go down into the cellar again. Last time I was in there I pulled out twelve empty bottles of wine, I wrote out twelve bible verses, put one in each bottle and then placed them in the bottle banks. This time I came across a number of other bags that had empty bottles in too, this time twenty five of them. So on New Year’s Day I decided it would be the perfect day to take these out and do the same with these, one verse for each bottle and then dispose of them. 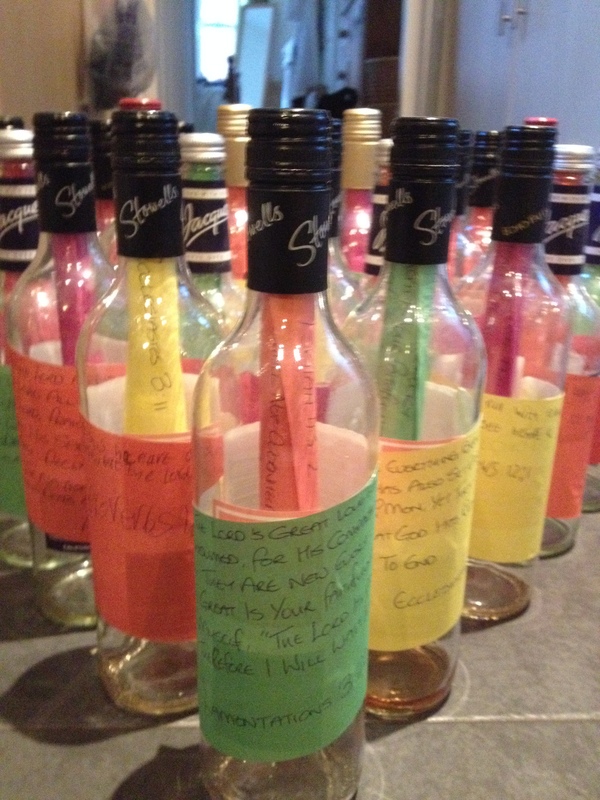 So I took the bottles out from the cellar, spent the moving searching for verse and writing them down on coloured paper, my daughter was inquisitive as to what I was doing, so she asked if I could help, mainly because I was using her coloured paper! She found a couple of bible verse for me and wrote out a few on the paper, but then they all went out once again and left me alone once more. So I finished writing out the verses, but this time I not only put them inside the bottle, but I stuck the verse on the outside of the bottle, over the label and then took them into town. As I placed each one into the recycling bins, I felt an enormous sense of freedom, a release from all the fears and anguished I had subjected myself to over the last few months, all of that seemed to lift as I let each one go. It was a new day, a new year and now a new start, I was determined not start 2014 the way 2013 had finished, I was determined that things were going to get better and I was going to start moving forward again, with the release of these bottles, I was hopefully finally letting go of the past and now could truly move forward. This entry was posted in Faith, Sobriety, The Story So Far and tagged Alcoholic, Alcoholism, Awakening, Bible Verse, Christ, Depression, Freedom, God, Inspiration, Jesus, Pain, Peace, Poetry, Pray, Prayer, Rebuilding, Recovery, Sober, Sobriety, Stress on April 21, 2015 by waynemali. Thank you for sharing so much of yourself. Too often people put on a mask and hide what has gone on in their mind and how they truly feel. The world never knows their struggles. It takes a strong person to be open. You do not know how many people read your writings and are encouraged. This is quite a story. WOW!!! This is how I would measure success, not by the size of your wallet but by the number of times you have fallen and risen above it. You have come out on top, well done!! God bless you and prosper you. Check out more of my posts on healing for more inspiration. ( are you interested in giving a testimony to a men’s prayer/discussion group in Melbourne? I’m sure they would love to hear it, let me know). Thank you for your encouraging comments and your invite to Melbourne, as much as I would love to come, I live over 10,000 miles away in the UK. I did a testimony video for my Church, you are more than welcome to show that, it is posted on here, but I can give you the link to it on YouTube. Yes, the link would be great thanks. God bless you. This is the link to the youtube video of my testimony, any problems, let me know.